Next up for our ‘Global Mix’ series are the Newbridge disco dons Mix & Fairbanks. The duo of Rob Smyth and Gary O’Reilly have been grafting away, putting in major studio time over the last few years and it’s easy to see that it’s been paying off. From standout sets at major festivals such as Electric Picnic, Longitude, Life Festival and Body & Soul to packed club shows in Hangar and District 8 as well appearing at Eastern Electrics festival alongside Skream and Dennis Ferrer, the pair have been entertaining crowds to no end. Over the last year they’ve had a number of releases picked up and played by the biggest names on the circuit, most notably their edit of Azoto’s track ‘Any Time Or Place’ which has been getting regular spins from the likes of Skream and Jacques Renaults. They’re releasing this as part of a four track EP on fellow disco connoisseur Dino Soccio’s label Pleasure Of Love and it’s due out tomorrow. 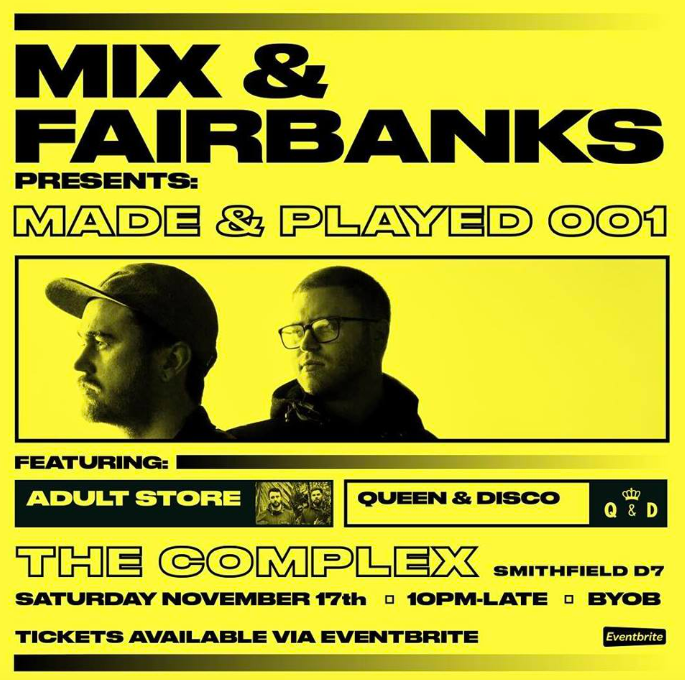 Make sure you catch them this Saturday at The Complex Dublin for their ‘Made & Played’ gig, a new series of BYOB events that have already proven to be very popular amongst music fans. They’ll be joined by Adult Store and Queen & Disco for what’s sure to be an incredible party. Without further adieu… The sounds of Mix & Fairbanks.